Reverse with a print of two deer in a landscape. Beneath the spout, a print with two game birds. 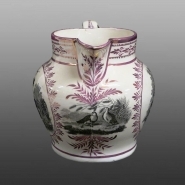 Bone china jug, painted with pink lustre bands and ornamental detail around the neck, and forming a frame for printed decoration on each side and beneath the lip. One side with two rabbits grazing, similar but not identical to a subject used by Spode. 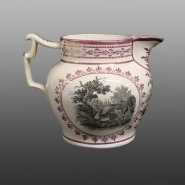 Beneath the spout is a print of two game birds, and on the reverse a print of a pair of deer.